Now that the year is half over, we have a good sense of the products that have really left an impression this year in the promotional world, and can rank the top 5 trends of the year. These top trends prove that you can get you message out in a trendy and fun way, regardless of your budget, and that there are always new options beyond the typical tote bag to use as your company’s advertising vehicle. Tech Accessories – Every year some type of technology item rises to the top of the trend list. This year, it isn’t necessarily a tech item, rather accessories to existing technology pieces that have the promotional world in a spin. Skins for smart phones, pen and stylus combos, fun ear buds, portable speakers, and anything iPad-related are the hottest items to put your logo on. By putting your logo on a technology accessory, it shows you are a forward-thinking company and ensures that the product will get used over and over again. Reusable Tumblers – You’ve seen them in every retail outlet and coffee shop, those tumblers that look like a plastic cup with a straw you are used to receiving at your favorite fast food joint. They are really reusable, acrylic tumblers, come in multiple sizes, colors and styles, and are topping our list this year. They are great for work, home or travel, have a great area to imprint your logo, and are eco-friendly! 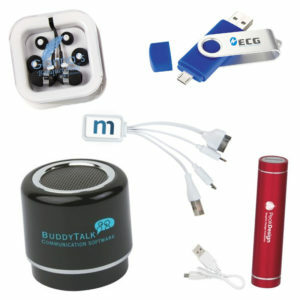 Give them to employees or customers at your tradeshow, summer event, or just to say thank you. Social Media Promoters – Social media continues to grow as a key marketing initiative for companies throughout the United States. QR Codes are a top social media tactic and promotional products are a great way to disperse the codes throughout the public to get more people to your site. You can print a QR code on anything from a stress block to a water bottle to a tote bag. It is a great way to utilize the hottest marketing tactics with your traditional promotional vehicles. Awareness Bracelets and Thumb Rings – Awareness bracelets are certainly not the newest product on the block, but this year the anti-texting thumb rings have flooded the market, which has led to resurgence in the awareness bracelet trend. These are an inexpensive and popular way to get your message out to the masses. Adults and kids alike are seen every day sporting silicone bracelets and rings. Make sure your message isn’t left out. Totally Unique Products – Look around at some of the hot, unique products in the retail market, and chances are, they will be showing up in the promotional industry before you know it. Right now the retro handheld phone that you can plug into your cell phone is generating a great amount of interest. It is a perfect item for anyone who wants to generate some buzz. Another unique promotional item this year is the portable grill/cooler. This item is ideal for any outdoor promotion. The promotional product industry is evolving as fast as the retail industry, and trends continue to grow and change. The great news is that there is always something new and unique to put your logo on and set you apart from your competition. Visit for new ideas for your next promotion.